Once again, Canada’s annual “fire season” is making headlines around the world. Environment and Climate Change Canada (ECCC) has issued a series of air quality alerts and safety precautions to help you through the unavoidable toxic fallout from this season’s wildfires. Here at Clean Air Solutions Hamilton, we want to offer you some additional timely tips for keeping your indoor air as clean and toxin-free as possible during this time. While none of us can control the quality of the outside air when fires are raging, we can have a great deal of control over the purity of our inside air—thank goodness! Read on for tips you can act on right away to clean and purify your indoor air. ECCC maintains a symptoms list online to alert you to the warning signs of smoke exposure. It is a good idea to familiarize yourself with these symptoms, especially if you or a loved one has a history of severe allergies or asthma. ECCC offers this list of precautionary steps you can take to manage the risk of smoke exposure during wildfire season. FireWork is an online tool that generates smoke forecasts over a 48-hour period. You can view a morning and evening forecast showing airborne smoke movement predictions based on wind direction. FireWork is operational each year from April 1 to October 31. When driving, set your vehicle’s ventilation system to “recirculate” so you are not drawing in smoke through the air vents. There is no doubt it can be a hardship to limit your outdoor activities, but your lungs, sinuses, and respiratory system will thank you for it. The more you can make arrangements to work out, enjoy sports, and other hobbies indoors where the air is being filtered, the healthier you will stay during wildfire season. This can include indoor use of tobacco products, wood-fired stove cooking, using your fireplace, burning leaf litter, using candles/incense, and other similar activities. Since the air is already burdened more than usual with smoke-related toxins, every little bit you can cut back will help you stay healthier. More people are now aware that many commercial cleaning products and personal care products like perfumes and air fresheners are not always safe to breathe. By opting for all-natural cleaning products and using essential oils rather than chemical perfumes and air fresheners, you can safeguard your indoor air starting now. Your local province likely maintains a health hotline with up-to-date information on air quality alerts. Here in Ontario, you can consult Air Quality Ontario for daily updates on air quality issues related to airborne smoke as well as other factors like smog. It can be frustrating to watch the wildfires once again spreading smoke across the clear skies above you. It can also be easy to stop taking air quality seriously when you live with the same annual cycle year after year. But smoke poisoning is nothing to take lightly—it can be life limiting and sometimes deadly. 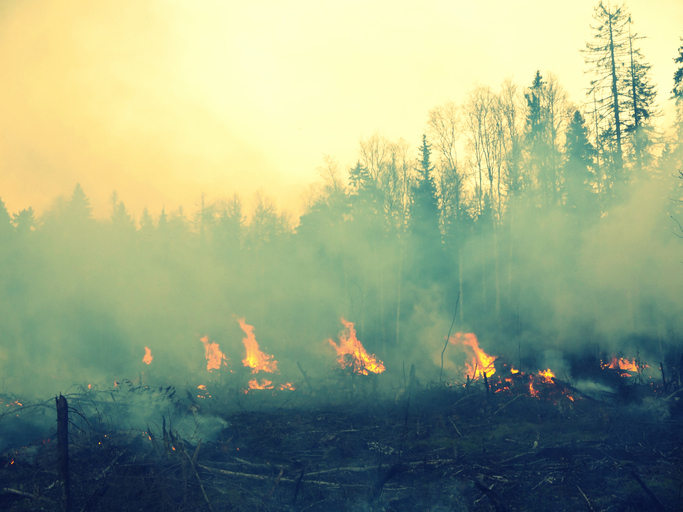 Since Canada’s wildfires are an annual occurrence, it can also make smart health and financial sense to take a proactive approach toward managing your own indoor air quality. These are the three best helps we have found to achieve consistently clean, pure, and healthy indoor air. High efficiency particulate air filters have been the gold standard in airborne toxin filtration since World War II, when HEPA filters were developed to filter radioactive micro-particles out of the air in scientific laboratories. You won’t find any better indoor air filtration anywhere in the world than the HEPA filtration systems you can get right here in Canada. Upgrade your HVAC to a unit rated for efficiency at 16 or higher that will work efficiently with HEPA-rated air filters. Install an external whole-home HEPA filtration system that works with your existing HVAC unit. Add portable HEPA filtration devices in each room of your home. Convert to a HEPA-rated vacuum and use it with your carpeting and flooring. This whole-home system isolates stale outgoing air from fresh incoming air to ensure all outgoing pollutants are disposed of safely outside your home. The heat recovery ventilator, or HRV for short, also automatically adjusts the humidity of your indoor air to maintain healthy levels between 30 and 50 percent. Most pertinently for wildfire season safety, the HRV comes with an inbuilt recirculated air mode to prevent airborne smoke toxins from finding their way inside your home’s air supply. UV air purifiers use powerful UV technology to destroy airborne toxins and odours. Both portable and central whole-home units are available. Right now, you can save 20 percent on ALL indoor air quality appliances and devices we sell! Learn more by completing this simple online form or just give us a call at 905-544-2470.